Each year about this time our friends at OSHA make a list of the most common violations of OSHA standard for the previous year. Each year I get the list and shake my head in wonder as I see the same common OSHA violations over and over. For as long as I can remember, the list of violated standards hasn’t changed much at all. I guess employers either cannot understand the impact of a violation and citation on their business or they just hang back hoping OSHA won’t come knocking on their door. OSHA just released the list for 2017, and it looks very similar to the list of 2016’s common OSHA violations. However, it’s still a great time to take a look at these common violations and refresh our memories of these regulations and how to keep yourself in compliance and out of trouble. Here is the list of the most common OSHA violations for 2017. This standard was originally written for the construction industry in hopes of preventing instances where construction workers tumble from heights on a construction site. In 2017, there were 6,072 citations written to employers for failing to protect their employees from dangerous or deadly falls. The list I saw did not show the total amount of fines levied as a result of the citations. However, under the Obama administration the increase in penalties associated with OSHA citations increased significantly across the board. In early 2017, OSHA expanded the scope of the Fall Protection Standard to cover not only construction but general industry as well. Now employers in businesses like manufacturing, distribution, warehousing, and retail are subject to fines if their employees are exposed to a fall caused by a change in elevation of as little as four feet inside their facilities. Walking/working surfaces also fall under the expanded standard. If you facility has uneven walkways, step-ups/step downs, or unguarded drop-offs you can be cited. The Hazard Communication Act was promulgated in the 1980’s. Basically, the act states that employees have the Right to Know about the hazards associated with chemicals used in the workplace. The Act requires employers to train all their employees on these hazards as well as to provide information to employees for their review. Material Safety Data Sheets (MSDS) were used up until 2013 to meet this requirement. Now, MSDS have been replaced by Safety Data Sheets (SDS) which are much broader. SDS sheets were contrived to comply with the Global Harmonization System (DHS) which standardizes chemical information across the world. I am still amazed at the number of employers who still think they comply with the standard by having a dusty old MSDS book on site. In 2017, there were 4,176 citations written to employers for failing to train their employees on SDS and GHS and for failure to provide SDS information to employees. This standard was originally written for the construction industry, where most scaffolds are used. However, many employers in the service trades like electricians and HVAC use scaffolds inside buildings to facilitate work on or near the ceiling. The construction standard applies to ALL industries that use scaffolds. The standard requires that scaffolds must be erected, used and struck under the supervision of a competent person. Companies that rent scaffolds from large construction rental companies must make sure that they have a competent person on staff. In 2017, there were 3,288 citations written to employers for violations of the scaffold standard. Most were issued to employers for failure to train employees properly, failure to provide a competent person, or failure to erect and use scaffold components safely. The Respiratory Protection Standard was initiated to make employers train employees regarding potentially unhealthy or hazardous inhalation hazards. Employers must also provide appropriate personal protective equipment (PPE) to employees working in hazardous environments. In 2017, there were 3,097 citations written to employers for violations of this standard. The scope of the Respiratory Protection Standard was broadened by the advent of the Silica Dust standard just last year. Now employers who have employees working in areas where silica dust is present (masonry, concrete, site prep, etc.) must take steps to protect their employees from the hazards of inhalation of cancer-causing silica. Most people assume that this standard is limited to just electrical applications. The standard states that all sources of energy (pneumatic, kinetic, hydraulic, etc.) must be locked out to prevent accidental start-up or movement of any machinery or apparatus under maintenance or repair. In 2017, there were 2,877 citations issued for violations of this standard—the majority of which were for failure to train employees. I can’t think of a single business that does not have some type of step ladder or step stool on site. The ladder standard was written initially for construction, but all employers are subject to citation for failure to comply. The standard requires all ladders to be inspected regularly and replaced if damaged. The standard also requires all employees to receive training on the safe use of ladders. In 2017, there were 2,241 citations written to employers for violations of the ladder standard. Think forklifts. Failure to train and license operators of forklifts, pickers, ride-on pallet jacks and other industrial trucks is the biggest cause for the 2,162 violations in 2017. In 2017, there were 1,933 citations written to employers who had moving parts of machines that were not guarded against accidental contact by an employee. Air compressors, conveyor belts, extruders, and other industrial machinery must be guarded at all points where an employee can contact a moving component. For some reason, OSHA decided to separate violations of the fall protection standard generated by failure to train employees from the rest of the violations of this standard. In 2017, there were 1,523 citations written for failure to properly train. I expect this number to jump significantly as employers are cited for walking/working surface and interior elevation changes now covered by this standard in general industry. This standard is cited in instances where employers attempt to make electrical connections outside of National Electric Code (NEC) guidelines. Running a machine permanently using an extension cord is an example. In 2017, there were 1,405 citations written for violations of this standard. With the exception of fall protection training, this list has been the same for the last fifteen years or so. OSHA has levied millions of dollars in penalties against employers for violations in 2017. Thousands of employees have experienced work-related injuries associated with these common OSHA violations. What’s an employer to do, then? First, obviously making sure that you are aware of the OSHA standards that apply to your business is paramount. Yes, there are OSHA standards that apply to every business. Second, since most OSHA standards have an employee training component, installing an employee safety program that includes employee training is vital. Making sure that new hires and temporary employees receive the same training as current employees is also very important. Third, keeping up with changes in OSHA regulations and updating your employee safety program to keep pace with the changes will help keep you noncompliance. If you are a large company, you no doubt have an expert on staff who can manage compliance issues and prevent these common OSHA violations. Small to medium-size employers, however, don’t have the luxury of a full-time safety team. That’s where Employers Resource can help. Our team of Safety Professionals has over 100 years combined experience in OSHA compliance. We speak their language and we keep up with all the changes. Get in touch with Employers Resource today to see how we can help. How Do You Establish a Safety Culture? 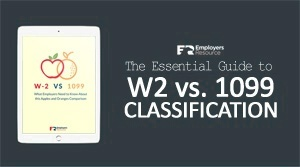 Carrying the Employment Law Compliance Burden Alone? HR Scenario: Reduction in Force (Part 2) Do You Have an Emergency Action Plan?